Embedding a video means that you can integrate a video from elsewhere on the internet (for example from YouTube) to your content. 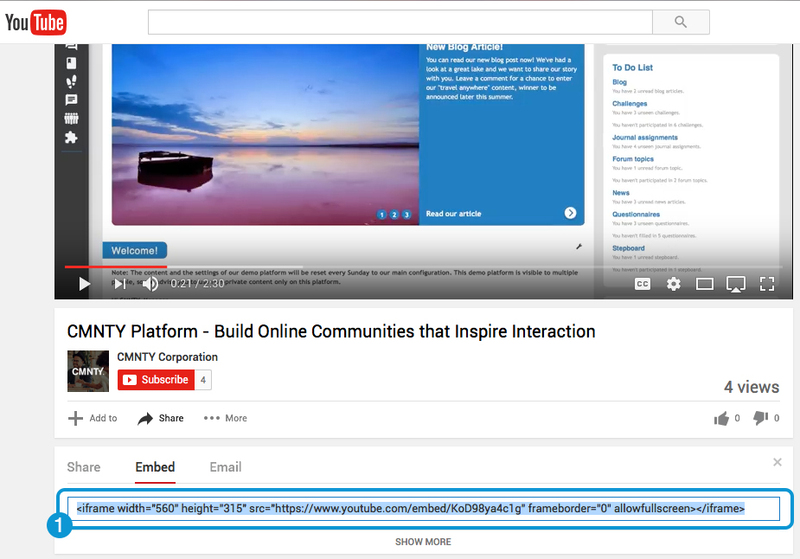 We support video embedding from YouTube and Vimeo. Go to Youtube or Vimeo page of the video that you want to embed and copy the embed code. Go to Blog under Module in Admin. Choose Add or Edit and place your cursor in the text where you want to add the video. Press on the insert video icon in the text editor. A pop up will show where you can add the embed code. Paste the embed code in the field. Press insert to see the video appear in your text. As a Community Manager, you can embed videos in: a Blog article, Challenge, Journal assignment, News article, Questionnaire (and its questions), Stepboard (and its steps), Webshop item, Custom Pages, Custom Elements and in the Default Messages. Read this article to find out more about our other features and modules! And, check out more about the capabilities of our platform here!